It has become customary to report state attacks on freedom of expression in Morocco. The latest episode in this unfortunate trend took place Tuesday. A court in Casablanca upheld an earlier court's three-year jail sentence against human rights activist Chakib Khayari, who previously accused some high-level civil servants of aiding in the cannabis trafficking. 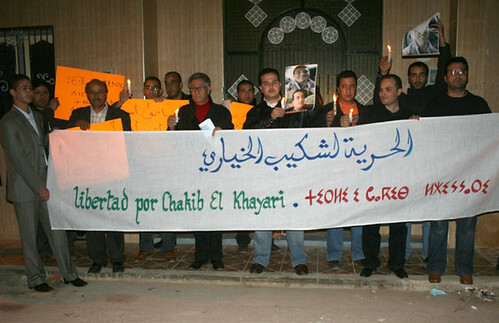 Khayari is the head of the Human Rights Association of the Rif region in the north of Morocco. As I reported in earlier posts, this regressive trend of stifling dissent is becoming the norm in the kingdom. The margin of tolerance is lower and lower and indicates the regime's inability to deal or absorb this form of dissent. The future trajectory of the state and its purported commitment to democratic reform inevitably has to go through the path of political expression. Such continuous repression of all forms of journalistic and individual criticism of the government and the regime will only serve to erode the last vestiges of entente between regime and society. Morocco and its people deserve at a minimum the right to address the most pernicious of topics. Drug trafficking is one of those dossiers that has to be subjected to open investigation and debate. The fact that the state moved quickly against Khayari only reinforces his allegations against state officials.